Barite has got to be one of my favorite minerals to collect for a variety of reasons: 1) its unique heft for being a nonmetallic mineral, 2) the variety of colors and conditions it can form under, 3) its flat, tabular crystal forms, and 4) its practical usage in products ranging from paper, paints, plastics, and petroleum drilling to medicine, vehicle engines, and electronics. In a span of a year, I had the opportunity to visit and collect in two Colorado barite localities: Hartsel and Two Creeks. What is striking is that the great specimens from each place might resemble each other in most aspects, but have two different origin stories! 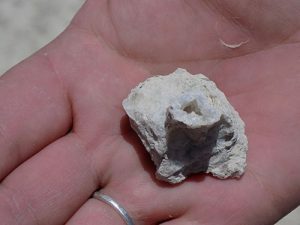 The suite of other “side” treasures that can be found, the sizes of crystals, accessibility to the site, and the degree of luck required to find specimens are also different in each place. To round out the contrasts, one site can be classified as a tried-and-true future classic (if not already considered as such), whereas the other is somewhat new. One site is located outside the small town of Hartsel, approximately two hours southwest of Denver, and the other is about 50 miles north of the town of Fort Morgan, in the northeast corner of the state. Blue barites found in the Two Creeks area are rarely over an inch long and have a characteristic amber-honey interior. I made my first visit to the town of Hartsel in August 2015 with the Littleton Gem & Mineral Club. The drive down from Denver was characterized by broad, beautiful valleys, as well as a pass through the real South Park. Our group met at the Bayou Salado Trading Post, along the main drag of town (U.S. Highway 24) to sign waivers with the property owners, Dark and Lark Harvey. They also own the trading post, and their phone number is (719) 836-2458. Spotting the trading post is quite easy, as it is a canary-yellow building with brick-red trim. Once carpools were arranged, we drove a very short distance west of town and uphill through a cattle pasture to get to the parking area/collecting site. The total driving distance is no more than five miles. A two-wheel drive vehicle can theoretically make it to the site, but navigation through washed-out portions of the dirt road might be required. 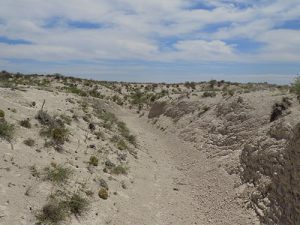 The great thing about the Hartsel site is that the primary digging area is right next to the parking area, so there is really no hiking required—unless one wants to explore the farther ditches in the wide-open fields, and even then, the hiking is minimal. The diggings are in the form of short slopes and ditches into the reddish soil that intersect the barite veins. The mineralization is hosted in limestone that is part of the Maroon Formation (Pennsylvanian-Permian age). This limestone makes up the southwestern side of a small geological basin. The red soil is from oxidized sandstone and shale that also belong to the Maroon Formation. Digging at this location has revealed small amounts of friable gypsum. It is thought that the red rocks are the original source of the barium, which was carried to the limestone either by hydrothermal saline solutions of magmatic origin or by meteoric waters (ordinary groundwater). It is strongly agreed upon that the structural basin played a major role in concentrating solutions in localized points for barite precipitation. Another noteworthy observation, gleaned from earlier geochemical analyses, is that the barite here is surprisingly lacking in the element strontium (since barium and strontium are both classified as alkaline earth metals, they often occur together in natural systems). The Maroon Formation red-beds also host several uranium-vanadium prospects. Once one enters the low-lying portion of the primary digging area, the vast sparkle of the ground is often the first thing noticed (presuming it is a sunny day). The grounds are littered with tiny barite crystals with some degree of pale-blue hue. It is physically impossible to walk away empty-handed! 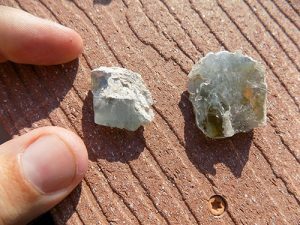 Another common find along the walking paths is inch-scale chalcedony nodules of varying hues. Club members have said the nodules have served quite well in various lapidary projects. The Hartsel barite is special in that, while it starts out a light blue-gray, with prolonged sunlight exposure, the crystals will gradually turn a darker shade of blue. With most light-sensitive minerals, sunlight seems to be the enemy, but I think it’s the opposite in this case. I first investigated a bending hill scarp nearby, but I did not find much significant barite. Glitters of dark steel-blue barite are everywhere in Hartsel’s red mud and contrast with it nicely! Feathery, white, millimeter-scale gypsum was plentiful, although not collectible. I found my first nice wave of significant individual crystals loosely embedded in the slope of an isolated knob, and then started to find more as I headed somewhat away from the main group. After a couple of brief breaks to socialize, I headed up to get my lunch. It turned out to be perfect timing, as we experienced a short, but intense, rainfall. After getting recharged from the confines of a truck, I ventured out a little farther south to a small, elongate ditch, where I found larger float crystals with better defined crystal shapes. Thinking these were very close to a source, I plopped down and made like a gopher. I started to pull out small clusters of beautiful baby blues nearly right away! In working laterally from one side to another, I seemed to exhaust this part of the vein quickly. I hypothesized that I had just hit either a veinlet (an offshoot of the main vein) or the pinch out of the main vein. During my digging, I became quite oblivious to where the bulk of the group had moved. Apart from a couple members who ventured out into the far fields, nearly everyone was at quite a large hole being dug near the parking area. 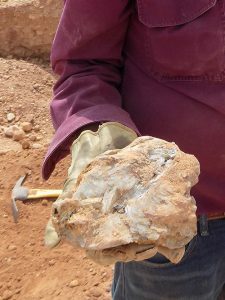 It turned out to be quite the buzz, as a visitor who had been to the site multiple times unearthed a barite cluster the size of a dinosaur egg! At around 3:30 p.m., we caravanned back to the trading post, where we showed off our finds and treated ourselves to compulsory ice cream. It would be another two years to the month before I would get another crack at Hartsel with the Littleton group. This time, I was fortunate to bring a digging partner, Jesse Garcia, with me. After finding more than 50 individual crystals, along with a dozen or so clusters, I was determined to find my “dinosaur egg”. Unfortunately, we got off to a slightly later start due to some vehicle trouble. By the time we signed the waivers and arrived on site, the group was 30 minutes into digging, and the site where the “egg” was found was, sure enough, occupied. I traced the seemingly productive vein, as marked by quite a deep ditch, a few meters over and started to shovel from above. I dug out few small clusters, but the clay, hardened from a lack of rain, proved quite the challenge to dig through. Meanwhile, Jesse had gotten quite a nice start with a wide, but shallow, hole just a few meters away, where large crystals just waiting on the surface. 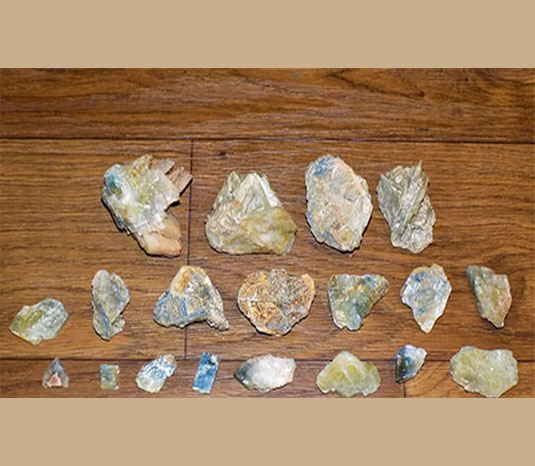 After joining back up with him, I really didn’t need to dig to come away happy with some respectable clusters and wonderful crystal forms, including a zoned, euhedral crystal that resembled an arrowhead. It only took about three hours during this trek for both of us to be satisfied. After conversing with several new members, we walked back to Jesse’s truck, making one more pass by the deep ditch—and extracted another egglike cluster! Perhaps the third trip will be the charm. The best find made on my first Hartsel trip—not by me—has a shape that I described as being like a dinosaur egg. 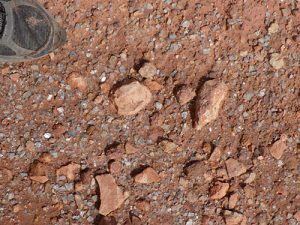 Nine months after I first visited Hartsel, I had partaken in my second trip with the club to the “relatively new” barite locality of Two Creeks. It is right next door to its more famous neighbor, Stoneham, which has produced many quality, prismatic crystals. The Stoneham locality has been closed off to all collecting by the Colorado State Land Board since the early 2000s. The barites that come out of Two Creeks have the same characteristic light-blue hue as those from Stoneham and Hartsel, but with one distinguishing difference: a golden-brown center that appears in some crystals. The few people I have asked about the chemical cause of this amber hue had no suggestions. I have not been able to find a definitive answer, but I doubt it is caused by iron. The barite here is hosted in a hardened bentonite clay matrix, which makes it harder to work there than at Hartsel. 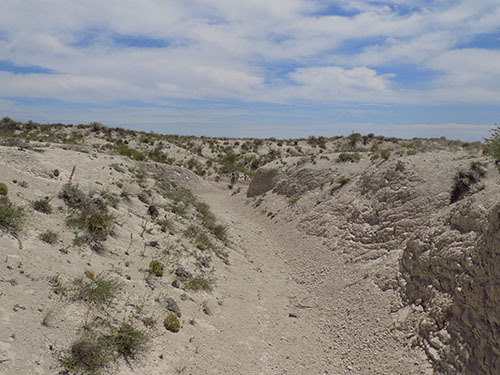 The bentonite is weathered volcanic ash that came from a Tertiary-age volcanic eruption in central Colorado known as the Thirtynine Mile volcanic field. Additionally, the ash contained anomalous barium. A while after the ash was deposited, it weathered into montmorillonite clay (now known as the Chadron Formation), which overlies the Cretaceous-age Pierre Shale, and is itself overlain by the Tertiary-age Arikaree Formation. Next, groundwater filtered through the clay, mainly along faults, remobilized the anomalous barium in the altered ash, and precipitated out barite. This area is also known for thin, small, but gemmy calcite geodes that are also hosted in the bentonite. Finding a geode here that is over 2 inches is considered lucky by most. One find to be wary of is fossil bones, which are federally protected on public lands (the area is part of the Pawnee National Grasslands). However, pictures can certainly be taken! I drove to Fort Morgan, 78 miles northeast of Denver, along Interstate 76/U.S. Highway 6. The club met in Riverside Park at 9 a.m. and carpooled an additional 32 miles due north on state Route 52 until it intersected state Route 14. We took Route 14 east for an additional five miles, then parked off-road at the intersection of Route 14 and state Route 71, which branches off to the north. The site is in the middle of the Pawnee National Grassland, and between the towns of Raymer and Stoneham. From the road, our field trip leader, Jim, led a three-quarter-mile-long, southeast hike to an area he’d had luck in the year before. Along the way, there was frequent dodging of “cow pies”, as well as “up-downs” through and over the bumpy gullies carved into the white, hard clay by storm runoff. While still moving southeasterly, a few group members scattered to briefly investigate the inlets connecting the main wide gullies, where crystals would most likely wash out into after a good rain. However, no finds were had until we had nearly reached the “lucky” area. I detected a cluster of small sparkles near the edge of a drop-off into a major gully. Within a 10-yard radius, I found my first bunch of six small barites (all under 1 cm), along with four larger calcite geodes. All pieces have a very thin—but stubborn to remove!—coat of sandy clay. I easily removed them with a trowel. 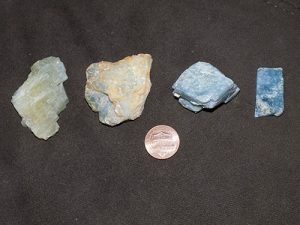 The spectrum of colors in the barite from Hartsel starts with milky light blue (left) and progresses to dark blue (right) with prolonged sunlight exposure. first several inches down are tough going, but not bad. After about 6 inches down, the clay becomes rock-hard and is much more difficult to dig through. Heavier artillery (which I did not bring) would have been useful. My first spot quickly became exhausted of crystals, and I headed to catch up to where the rest of the group appeared to have collectively set up shop. It appeared that Jim had enjoyed the same level of good luck he had on his prior visit. He had shown me larger crystals—some with the golden centers—as examples of what to look for, along with a permineralized worm burrow lined with tiny, but gemmy, dogtooth calcites, just like a geode. He allowed me to have the burrow for my classroom. At this second spot, I searched around small, dead brush thinking that these areas were not as disturbed. The first bush turned out to be the charm, as I pulled my best crystals of the day from there. The first crystal turned out to be the largest: 2 cm, with minimal sandy coating, and a very dark honey center. It turned out to be, in the group’s opinion, one of the top two crystals found that day. I found some additional, smaller, paler crystals around the roots. Pretty much everyone claimed they had absolutely no luck in finding anything farther down than 3 inches. It should be noted that, whereas crystals from Hartsel can be either single crystals or stacked or intersecting clusters, the Two Creeks crystals seem to be of the single-crystal variety exclusively. Another difference from the Hartsel crystals is that the colors of the Two Creeks specimens do not seem to alter with prolonged sunlight exposure. I went back to Two Creeks with another friend, Chris, a little over a year later to try our luck again. On this visit, we tried another approach: We searched around the tops of cliffs where small outwashes (streams or gullies) would terminate, just before going over the edge. As it turned out, our hypothesis was mostly correct, and we found a good deal more crystals than on our first individual visits. Some digging—3 inches or so down—was still needed, and it was still hard! Interestingly enough, we looked down into the main, deep gullies to where water runoff might dump crystals from above, but did not find any. As with the second trip to Hartsel, Chris and I did not stay as long, due to the increasing intensity of the sun, but considered that our new finds reigned victorious over the first ones. Those who wish to try their luck at Hartsel will pay an entry fee of $10 per person. This will get you directions to the Harvey’s claim and entitle you to carry out a maximum of 20 pounds of barite. It is a wonderful site for children who are starting out in rockhounding. The claim is open to visitors after the ground has thawed—due to the wacky Colorado weather, this can be as early as March or as late as June! Those wanting to try their hand up north at Two Creeks will find it is open grassland, accessible to anyone. Just be mindful to not leave behind any trash. The U.S. Forest Service makes rounds in the area, and might warrant closure of this area, as well as Stoneham. Since there is no shade to be found anywhere, sun protection is vital. The risk of sunburn is exacerbated by the high reflectiveness of the bright-white clay, especially if you dig in the deep stream channels. Who knows? With enough hard work digging in the clay, and some luck, one may come up with a blue treasure. The Two Creeks collecting area is an interconnected series of dry wash gullies. The light-colored clay can reflect the midday sun, so that being in the streambeds can pose as a potential heat hazard for the unprepared.